Welcome to GADS Open Source™ Support! GADS/OS Data Entry, GADS/OS Analysis & Reporting, and GADS/OS Wind™ give generating companies tools to take control of their mandatory GADS reporting to NERC and the various ISOs. GADS/OS is a set of free and open source software tools and is licensed under the GNU General Public License Version 2 (GNU GPL or simply GPL) which is the most widely used free software license. GADS/OS is in use at the New York ISO and a wide range of generating companies, both domestically and internationally, from single-plant sites to larger generating companies with hundreds of generating units. by the ISO New England, the New York ISO, the PJM Interconnection, and the Midwest ISO. 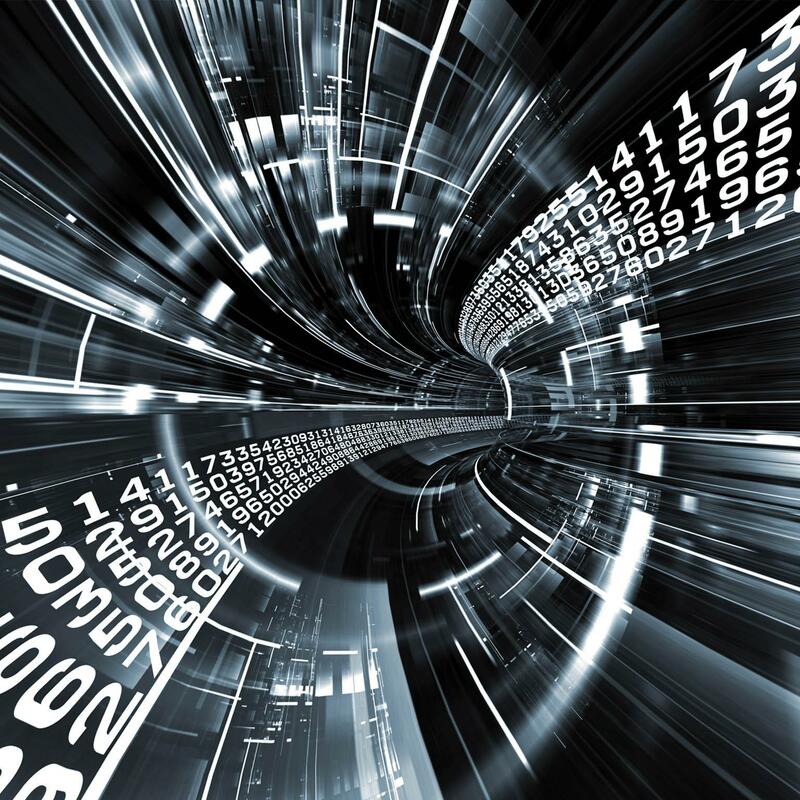 GADS Open Source™ can generate validated data files to upload/submit to NERC and the ISO/RTOs. Using the most current industry-standard Microsoft® Visual Basic.NET, ASP.NET, and C# languages and software development tools with the corporate standard database management systems of Microsoft Access, Microsoft SQL Server™ 2012/2014/2016/2017, and Oracle Database 10g/11g/12c enables our software to provide reliable and scalable solutions regardless of current or future operating systems—including both the 32-bit and the 64-bit Windows operating systems. With more than 30 years of GADS data reporting experience, this expertise ensures that you are getting the best GADS software tools available anywhere. NERC developed the GADS Data Reporting Instructions to assist utility personnel in reporting information to the Generating Availability Data System (GADS). The GADS Data Reporting Instructions detail the data elements collected by GADS, data identified by the industry as being vital to the understanding and interpretation of generating unit and major equipment performance. By following the strict guidelines set forth in these instructions, we have found that the industry analysts can best apply the data in the most beneficial manner. GADS/OS Data Entry allows you to collect and report validated GADS performance data and event data (including outage, derating, non-curtailing, and reserve shutdown events plus special synchronous condensing and pumping operation event types) in standard formats required by NERC GADS and all major ISOs. GADS data is collected for all major generating unit components—such as the boiler, nuclear reactor, heat recovery steam generator (HRSG), combustion turbine/jet engine, steam turbine, and generator—and other plant systems, subsystems, and components. 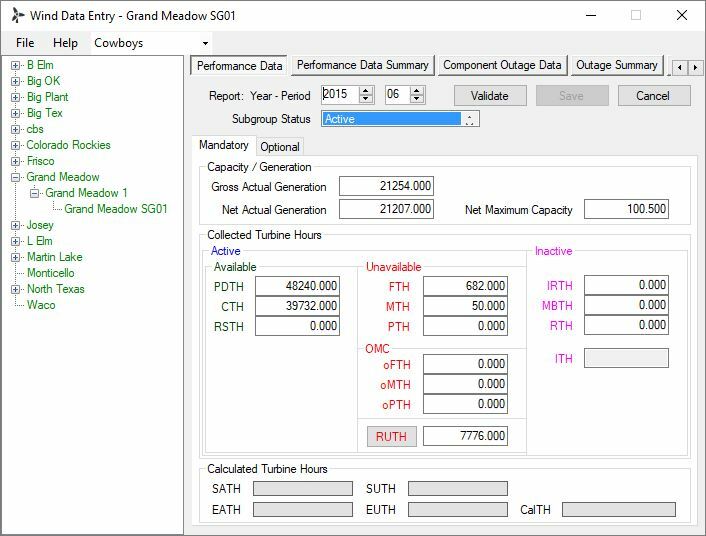 GADS/OS Analysis & Reporting allows you to calculate industry-standard performance measures for reliability, availability, and maintainability (RAM) assessments and key performance indicators (KPIs) using the GADS data for your generating units as the basis for those calculations. Measures of generating unit performance — such as Availability Factor (AF), Equivalent Availability Factor (EAF), Forced Outage Rate (FOR), Equivalent Forced Outage Rate (EFOR), and Starting Reliability — have been defined, recorded, and utilized by the electric power industry for more than 50 years. The statistics can be calculated with and without OMC events from granularities as fine as hourly and daily to as coarse as yearly or longer. 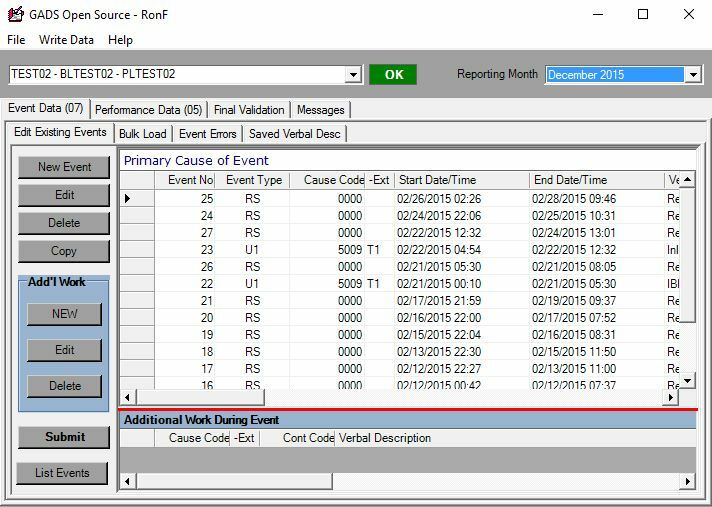 In addition to more than 47 standard built-in reports, you can also add user-created reports built with SAP's Crystal Reports to the Analysis & Reporting reports list and run them from within the Program. 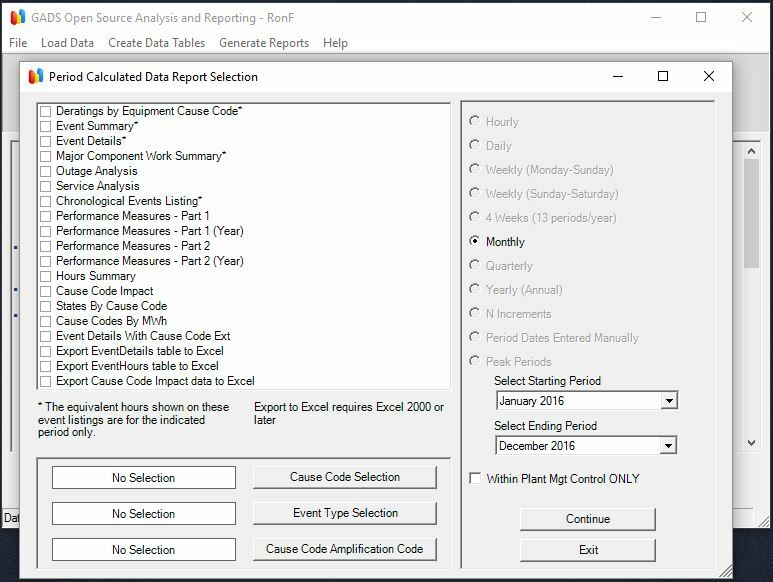 Exporting to Excel is built into the Program and is always available to create simple, as well as easy, ad hoc reports. Analysis & Reporting not only calculates these important standard measures, but also includes measures such as the Equivalent Demand Forced Outage Rate (EFORd) used in UCAP/ICAP calculations that have been developed to respond to the deregulated capacity and energy markets. EFORd - Equivalent Demand Forced Outage Rate (EFORd) was added to IEEE Standard 762 in 2006. However, this equation has been used by the PJM Interconnection and the Canadian Electricity Association (CEA) for many years. It is not used by all ISO organizations as a measure of reliability and dependability. NERC GADS started calculating this number about 10 years ago and it was added to our software and other reports at that time. NERC GADS follows the IEEE 762 formula for calculating EFORd. GADS/OS Wind™ allows you to collect, analyze and report validated data as specified in the GADS Wind Turbine Generation (GADS‐W) ‐ Data Reporting Instructions (DRI) Version 2.0 (Revision Date: 10/30/2017 - Effective Date: 01/01/2018). The NERC DRI was developed to assist plant personnel in reporting information to NERC’s GADS Wind Reporting application. The instructions detail the procedures, schedule, and format to follow when reporting data. Our GADS/OS Wind software complies with the latest requirements. If you have existing software to collect GADS wind data, now is the time to ensure that it complies with DRI Version 2.0 (Revision: 10/30/2017 - Effective: 01/01/2018). Sub-Group Data – Initial and whenever there is a change. GADS/OS is installed as a Windows-client application on individual user machines, on a virtual machine/desktop, or on a network (shared) drive. You can learn more about GADS by downloading the GADS Data Reporting Instructions (conventional generation) and the GADS Wind Turbine Generation Data Reporting Instructions at NERC. A video is also available entitled: "Introduction to GADS" (4m 11s) by NERC on Vimeo. The Site may contain links to and from third party web sites for your convenience. All trademarks used or referred to in this website are the property of their respective owners. Copyright © 2017-2018 Engineering Data Technologies. All rights reserved.